Figure 25.1. Incremental value of emission rights for (a) carbon, (b) CH4, and (c) N2O, 2010-2100 (alternative temperature ceilings). early decades of the 21st century will have a negligible effect on temperature in the late 21st century. As we approach the temperature ceiling, however, emitting CH4 becomes increasingly problematic. By contrast, N2O has a lifetime more commensurate with that of CO2. Hence, its price ratio is less volatile. The price ratios are sensitive not only to the proximity to the ceiling, but also to the ceiling itself. Limiting the temperature increase to 2° rather than 3°C produces an entirely different set of weights. Figure 25.2. Prices of a ton of (a) CH4 and (b) N2O relative to carbon (alternative temperature ceilings). change and the rate of temperature change (Peck and Teisberg 1994; Alcamo and Kreileman 1996; Toth et al. 1997; Petschel-Held et al. 1999). 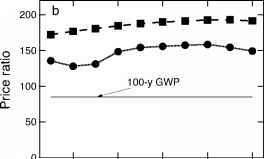 To explore this possibility, we impose an additional constraint on the two temperature scenarios by limiting the allowable increase during a single decade to 10 percent of the total allowable increase. That is, decadal temperature change is limited to 0.2° and 0.3°C, respectively. With a 2°C ceiling on absolute temperature change, there are decades during the 21st century where the limit on the rate of temperature change would be binding. From Figure 25.3, note that the price ratios for CH4 reflect what we observed earlier—the closer we are to the temperature constraint, the more valuable CH4 becomes. This appears to be true whether the constraint is on absolute temperature change or on the decadal rate of temperature change. Figure 25.3. Prices of a ton of (a) CH4 and (b) N2O relative to carbon (constraint on absolute decadal temperature change). Thus far, we have assumed that the objective is cost-effectiveness. That is, the objective is to minimize the cost of meeting a specified target. In this section, we illustrate how the model can be used to identify relative prices when the goal is to balance the costs of abatement against possible achievements in terms of reducing environmental damage. Before proceeding, however, a major caveat is in order. Given the rudimentary state of the existing knowledge base, it would be unwise to place too much weight on any particular set of damage estimates. The purpose of this section is to illustrate how such an analysis might proceed. Nevertheless, even an illustrative analysis can yield some useful insights into the nature of the price ratios. Figure 25.4. Prices of a ton of (a) CH4 and (b) N2O relative to carbon when the objective is balancing costs and benefits. (1996) reviewed several studies of the potential impacts of climate change on the United States. With regard to market impacts, these studies showed considerable disagreement at the sectoral level. For the present analysis, we assume that a 2.5°C increase in temperature (beyond current levels) would result in market damage on the order of 0.25 percent of GDP to Annex B countries. Unfortunately, there has been relatively little analysis of the potential impacts of climate change on developing countries. Because they tend to have a larger share of their economies concentrated in climate-sensitive sectors, we assume that market damage is apt to be a higher percentage of GDP. Specifically, we assume that a 2.5°C increase in temperature would result in market damage of 0.50 percent of GDP in developing countries. For all regions, market damage is projected as proportional to the amount of temperature change. For our base case estimates of nonmarket damage, we assume that when per capita incomes approach US$40,000 (about twice the 1990 level in the OECD countries), consumers would be willing to pay 2 percent of their income to avoid a 2.5°C increase in temperature. (As a point of reference, the United States today spends about 2 percent of its GDP on all forms of environmental protection.) For high-income countries, we assume that damage would increase quadratically with increases in the mean global temperature. For example, consumers would be willing to pay 8 percent of their income to avoid a 5°C increase. Of all the parameters in our model, this is perhaps the most uncertain. For purposes of sensitivity analysis, we explore a much more pessimistic scenario, one in which consumers are willing to pay 2 percent of their income to avoid just a 1°C increase in temperature and 8 percent of their income to avoid a 2°C increase. Figure 25.4 compares the prices of CH4 and N2O relative to that of carbon. These results are similar in many respects to that of the cost-effectiveness analysis with a constraint on absolute temperature change. With a temperature ceiling, we are in essence adopting an L-shaped damage function. That is, we are assuming that damage is zero below the ceiling and infinite thereafter. 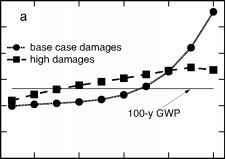 By contrast, with the aggregate damage function employed in our benefit-cost analysis, we have damage rising slowly in the early years and more rapidly later on. While not exactly an L-shaped damage function, it nevertheless produces qualitatively similar results. That is, we again find the value of the non-CO2 gases relative to CO2 to vary over time. We also find the value of CH4 to increase significantly as we approach the bend in the damage function. Finally, we find that the price ratios are sensitive to the damage functions adopted for the analysis. Until recently, climate policy analyses have focused almost exclusively on CO2 emissions abatement. This is not surprising, given the importance of CO2 relative to other greenhouse gases, the capabilities of existing models, and the paucity of data related to the non-CO2 gases. Nevertheless, a focus on CO2 emissions only can lead to significant biases in the estimation of compliance costs. Accordingly, existing models are being modified to account for a broader array of greenhouse gases. This chapter documents one such modeling effort. Before summarizing our conclusions, we again stress the preliminary nature of the results. Calculating the long-term implications of CO2 emissions abatement has always been a daunting task. The problem is compounded with the addition of other gases. Still, we believe that the present analysis, although illustrative in nature, highlights some important considerations for policy makers. cost strategy for not exceeding the ceiling. 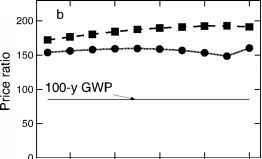 We found that the price of the non-CO2 gases relative to that of carbon tended to vary over time. This was particularly so in the case of CH4. With its relatively short lifetime, its value increased as we approached the temperature ceiling. The tighter the ceiling, the more rapid the increase in value. We observed a similar phenomenon when we added a constraint on the rate of temperature change. The incremental value of CH4 was particularly high when the rate of temperature change approached the prescribed limit. A number of studies have noted that in order to derive optimal control policies, we must consider the discounted damage of emissions from each gas. Here, the goal is to balance the cost of abatement with what such reductions might achieve in reducing environmental damage. Although this approach provides a more rational basis for climate policy, we currently lack the necessary knowledge base for specifying the shape of the damage functions and for valuing undesirable impacts. Nevertheless, through sensitivity analysis we were able to develop some insights about the relative weights of the various gases. Both the cost-effectiveness analysis and the benefit-cost analysis highlight the shortcomings of GWPs for establishing equivalence among gases. Not only do the efficiency price ratios vary over time, but they also are sensitive to the ultimate goal. Ideally, the price ratios would be the product of an analysis that minimized the discounted present value of damage and mitigation costs. Unfortunately, given the current state of knowledge regarding potential damage, such an approach may be premature. If indeed this is the case, focusing on temperature change may have distinct advantages over GWPs. It could serve as a useful surrogate for benefit-cost analysis—at least for the time being. We have benefited from discussions with Joe Aldy, Jae Edmonds, Larry Goulder, John Reilly, John Weyant, Tom Wigley, Larry Williams, and Tom Wilson. We are indebted to Christopher Gerlach and Robert Parkin for research assistance. Funding was provided by EPRI (Electric Power Research Institute). The views presented here are solely those of the individual authors. Comments should be sent to [email protected]. 1. See the 1999 special issue of The Energy Journal on the Costs of the Kyoto Protocol: A Multi Model Evaluation for numerous examples. 2. See Reilly et al. (1999) for an example of a multi-gas analysis of the costs of complying with the Kyoto protocol. 3. See, for example, Reilly and Richards (1993), Schmalensee (1993), Fankhauser (1995), Kandlikar (1995), Tol (1999), and Reilly et al. (1999). Also see Wigley (1998) for a discussion of GWPs and their shortcomings. 5. In contrast to Reilly et al. 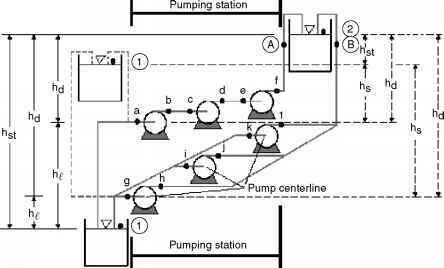 (1999), we use linear marginal abatement cost curves. Both coincide at US$100 per ton. For discussions of the potential for CH4 abatement, see Kruger (1998), USEPA (1999), and Houghton et al. (1996). The latter also contains a discussion of the potential for N2O abatement. 6. Equity need not be sacrificed in order to achieve efficiency. There are alternative ways to make side-payments between regions. 7. 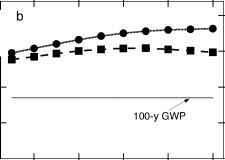 Note that we have converted the GWPs from carbon dioxide equivalents to carbon equivalents. Alcamo, J., and G. J. J. Kreileman. 1996. Emission scenarios and global climate protection. Global Environmental Change 6 (4): 305—334. Conference of the Parties. 1997. Kyoto Protocol to the United Nations Framework Convention on Climate Change, Third Session, Kyoto, December 1 — 10. Fankhauser, S. 1995. Valuing climate change: The economics of the greenhouse. London: Earthscan. Greenhouse Gas R&D Program technical report. Paris. Kandlikar, M. 1995. The relative role of trace gas emissions in greenhouse abatement. Energy Policy 23 (10): 879-883. Kruger, D. 1998. Integrated assessment of global climate change: Modeling of non-CO2 gases. Energy Modeling Forum No. 16. May 15. Washington, DC: Methane and Utilities Branch, Atmospheric Pollution Prevention Division, Office of Air and Radiation, U.S. Environmental Protection Agency. Nordhaus, W. 1991. To slow or not to slow: The economics of the greenhouse effect. Energy Journal 101 (407): 920-937. Peck, S., and T. Teisberg. 1994. Optimal carbon emission trajectories when damages depend on the rate or level of global warming. Climatic Change 28:289-314. Petschel-Held, G., H.-J. Schellnhuber, T. Bruckner, F. L. Toth, and K. Hasselmann. 1999. The tolerable windows approach: Theoretical and methodological foundations. Climatic Change 41 (3-4): 303-331. Reilly, J., and K. Richards. 1993. Climate change damage and trace gas index issue. Environmental and Resource Economics 3:41-61. Reilly, J., R. Prinn, J. Harnisch, J. Fitzmaurice, H. Jacoby, D. Kicklighter, J. Melillo, I! Stone, A. Sokolov, and C. Wang. 1999. Multi-gas assessment of the Kyoto Protocol. Nature 401:549-555. Schmalensee, R. 1993. Comparing greenhouse gases for policy purposes. Energy Journal 14 (1): 245-255. Smith, J. 1996. Standardized estimates of climate change damages for the United States. Climatic Change 32 (3): 313-326. Tol, R. S. J. 1999. Methane emission reduction: An application of FUND. IVM-D99/3. Amsterdam: Institute for Environmental Studies, Vrije Universiteit. Toth, F. L., T. Bruckner, H.-M. Füssel, M. Leimbach, G. Petschel-Held, and H.-J. Schellnhuber. 1997. The tolerable windows approach to integrated assessments. Pp. 403-430 in Climate change and integrated assessment models: Bridging thegaps-Proceed-ings of the IPCC Asia Pacific Workshop on Integrated Assessment Models, United Nations University, Tokyo, Japan, March 10-12, 1997, edited by O. K. Cameron, K. Fukuwatari, and T. Morita. Tsukuba, Japan: Center for Global Environmental Research, National Institute for Environmental Studies. USEPA (U.S. Environmental Protection Agency). 1999. Costs of reducing methane emissions in the United States. Washington, DC: Methane Branch, USEPA. Wigley, T. 1998. The Kyoto Protocol: CO2, CH4 and climate implications. Geophysical Research Letters 25 (13): 2285-2288.